WASHINGTON, Apr 2 2013 (IPS) - World Bank President Jim Kim has unveiled a series of new institutional goals aimed at ending extreme poverty by 2030 and focusing on the promotion of “shared prosperity” – increasing the incomes of the poorest 40 percent in each country while placing increased focus on dealing with climate change. In a major speech at Georgetown University here on Tuesday, Kim fleshed out themes that he first introduced last fall, outlining a vision for how the World Bank can evolve and remain relevant in the coming decades. With an annual lending budget of around 30 billion dollars, the Washington-based bank remains one of the world’s largest development institutions. “We are at an auspicious moment in history, when the successes of past decades and an increasingly favourable economic outlook combine to give developing countries a chance – for the first time ever – to end extreme poverty within a generation,” he said. While those living on less than 1.25 dollars a day stood at 43 percent of the developing world in 1990, by 2010 that figure had fallen to 21 percent. The new plan would now bring this number down to three percent by 2030. Kim warned that the new goals were extremely ambitious and would require “concerted global action on an unprecedented scale”. While cutting global extreme poverty levels in half – the first of the Millennium Development Goals (MDGs) – took some 25 years to accomplish, Kim said the 2030 goal would require cutting poverty levels in half, then in half again, then nearly in half a third time. The speech is being widely welcomed by development agencies and scholars. Indeed, climate change and inequality will now constitute a primary focus in all World Bank projects. On the first issue, Kim stated the bank is currently exploring ways to institute carbon markets and eliminate fossil fuel subsidies, among other initiatives. On the second, Kim urged countries to “break the taboo of silence” around inequality, warning that around 1.3 billion people continue to live in extreme poverty despite massive economic leaps over the past decade. Still, some are worried that the bank’s focus on the poorest 40 percent in each country will not do enough to address this growing inequality. As the bank begins to implement Kim’s new vision, Jacobs is urging the institution to commit to specific policies and investment priorities, including free universal public health and education services, fairer taxation, and replacing fuel subsidies with programmes that build the resilience of poor people in the face of climate change. 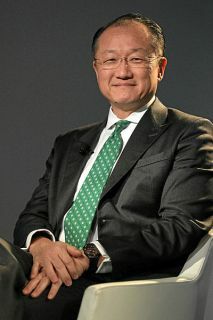 Kim’s new vision for the World Bank comes in the context of two milestones. First, this week marks a thousand days until the end of 2015, the deadline for achievement of the MDGs. While Kim said progress towards the MDGs, which are to be achieved by 2015, has been notable but uneven, he also pointed out that many developing economies have weathered the international economic crisis better than developed countries. World Bank forecasts currently suggest developing economies as a whole will grow by 5.5 percent this year, followed by incremental increases the following two years. Second, Tuesday’s speech comes just days after five middle-income countries – Brazil, Russia, India, China and South Africa, known as the “BRICS” – unveiled new plans for a BRICS-funded development bank, to be initially capitalised at around 4.5 trillion dollars, that would work in concert but also in competition with the bank. Due to this and other fast-changing dynamics, many are suggesting the bank will need to adopt new models to maintain its relevance. On Tuesday, Kim announced a new institutional focus on what he’s calling a “science of delivery for development”, which he says will position the bank to facilitate networking between development practitioners in developing countries. “Knowledge transfer of new models of downstream work that takes a more social enterprise approach, rather than being state led – this is what is fresh and exciting in the new models of global South-South collaboration currently taking place,” Asif Saleh, communications director for BRAC, an international development organisation based in Bangladesh, told IPS. While others suggest that development and delivery issues are more art than science, the initiative in general appears to be signalling a new direction for the World Bank. “‘Science’ suggests that these approaches work the same the world over, whereas delivering development is entirely context dependent,” Charles Kenny, a senior fellow at the Center for Global Development (CGD), a Washington think tank, told IPS. Despite the scope of the new goals unveiled on Tuesday, Kenny says that Kim’s speech outlines a realistically scaled-down vision of the bank’s long-term global role. “If absolute poverty is gone in 2030, the bank will need something to do, so this is a vision for the bank’s role in a richer world,” he notes. Dr. Kim will need to be a magician to make meaningful changes in the way in which the WB operates. The WB has been a causal in the intractable poverty in many regions of the world where, in concert with the IMF, institutional directives to poor countries have served to enslave them in deeper poverty and loss of natural resources. As is most often the case, the “Devil is in the Details,” and if Dr. Kim is serious then he must know the WB has to go up against corporations and political players who continue to gain by keeping the poor…poor. Since time IS running out, I retain a small bit of hope that Dr. Kim will realize there is everything to lose and that he will stand boldly and authentically against the well known, but stronger, forces which are the root causes of poverty in this world.